We celebrated Boxing Day in London by doing some more wandering about town. One of the places we checked out was London’s Chinatown. While a lot smaller (it’s essentially Gerrard Street in Soho) and more compact than the Chinatowns in San Francisco, New York, and Montreal that I’ve recently experienced, it does sport a quite impressive number of Asian markets, and more importantly, restaurants. So we used this as a good opportunity to check out New World Chinese Restaurant, one of London’s better-known (and older) Dim Sum restaurants. While London has a lot of Dim Sum places (I’ve been to Ping Pong several times, for example, although, oddly, I never seem to have written it up here…), New World is one of the few bastions of the traditional dim sum experience, with traditional Hong Kong-style dim sum dishes brought out to you in an unending parade of steel trolleys being wheeled by your table, so you can simply point to the dishes that look good and have them dropped off. So without much effort at all, you can easily sample any of a number of dim sum dishes being dropped off in bamboo steamers, plates of barbecued meats, little dishes of fried or steamed dumplings, and the occasional bowl of soup. 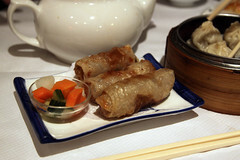 As far as variety, New World is indeed pretty strictly old school dim sum. While having a very good range of dumplings, soups, and meats, pretty much everything here I sampled was straightforward Chinese dim sum, with one plate of Vietnamese-style Cha Gio being the sole exception. But, as I always say, you don’t need to do a lot, as long as you do it well, and my dumplings were done very nicely. 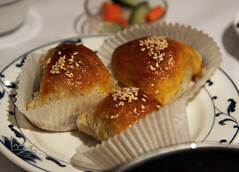 My buns had nice fluffy exteriors, and a nicely seasons tangy pork interior. My rolls were nicely fried and not overly greasy, and the steamed dumplings were cooked thoroughly without being overly gummy. In short, they’ve got the dim sum thing well under control. And I really like that they still do trolleys—while menu service allows a lot of fresh and inventive dim sum to be made to order, there’s always something to be said for being able to have the instant gratification of getting a fresh dish right off of the cart. Overall, while there are a lot of more modern and inventive Dim Sum places in London, an old-school Dim Sum joint like New World still has its place, and we thoroughly enjoyed the quality of our dim sum, and the relative affordability of it as well. Between that and the nice old-school decor (New World still has the perfect 1960s Chinese Restaurant ambiance), made for a rather pleasant outing. (Closed) The corner of Church and Main in Burlington is one of those spots that frustrated me. At the very bottom of the Church Street Marketplace, it’s a nice location, and for quite a few years it was the home of one of my favorite Burlington restaurants, Smokejack’s. However, like a lot of restaurants (good and bad), Smokejack’s closed in 2008, and the place sat empty for a few years before finally reopening as Church and Main. We’d walked by it several times since it opened, and people always seemed to be enjoying themselves in there (particularly with cocktails), so when I had to find a place in Burlington to celebrate Carol’s birthday, I decided to give Church and Main a try.